The house disposes of 2 Floors:Ground floor: living room (TV sat and stereo) with fireplace and couches, ample closet.The kitchen is well equipped for 8 persons, dishwasher, refrigerator, freezer, microwaves, oven, juicer, iron, toaster.Veranda with garden furniture (lake view).First floor: double bedroom with lake views from where you enter directly to the bathroom (bathtub/shower). A very spacious room of two bunks beds (4 places).A smaller room with 2 single beds.At the and of the corridor you find another bathroom with shower.Amenities:Bedding: 1 king size, 2 single bed, 2 bunks beds.Laundry machine. Sheets and towels included. Freezer. TV. Private parking lot.Cooking stove. Oven. Microwave oven. Refrigerator. Shower. Bath tub. Cellar.Heating. Fireplace. Stereo. Cable TV/Satellite TV. 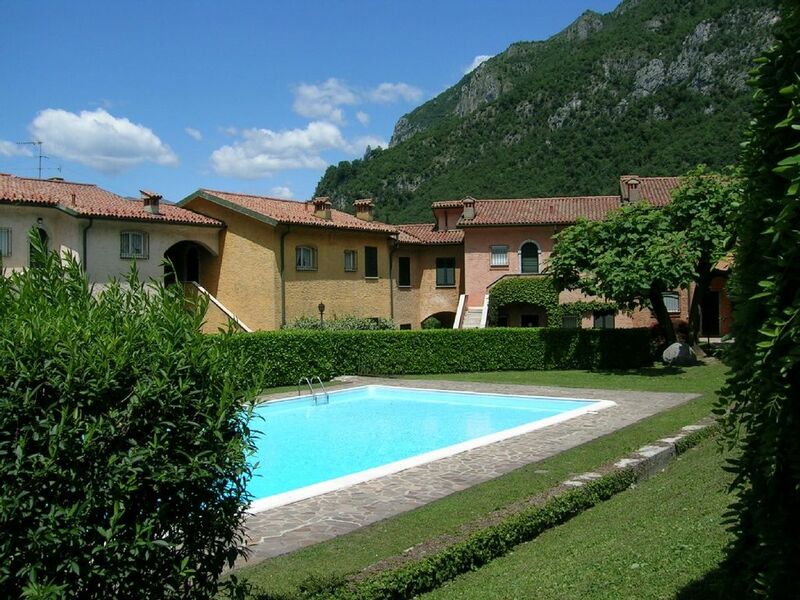 Two x 3 bedroom houses in Lierna, 5 minutes walk from the shores of Lake Como. Located in a residential complex with 2 heated pools, tennis court etc. 500 meters from the centre of town where you will find cafe, shops, supermarket, restaurants and railway station. Spacious apartment (120m2 on one floor, ground floor) situated by the Lake of Como, on the Lecco side, where the lake is shining. This houses (with an outstanding view over the lake) belong to a residential area. Among the rest, the facilities we can provide are: 2 swimming pools, tennis court, covered car park, 10.000 m2 communal park, electrical gate provided with your own code and remote control. Villa Smeraldo and Topazio are situated in Lierna, a small and typical village on the lake, 200 m away from La Riva Bianca, one of the widest beaches of the lake. Close to the house you will find many shops, bars, restaurants etc. Not far from the house you can visit Varenna (5 km away), and the lake coast. This area is also ideal for winter sports (ST. Moritz being 1 hour drive away) and well positioned to visit Milan avoiding traffic jams, by travelling by train . The Ferry Boat will easily take you to Bellagio and the opposite side of the lake. Villa Smeraldo and Topazio are equipped with a covered car park and a private garden fully furnished to have your meals on the patio. Not far from the house there is a restaurant called 'Il Crotto' where local specialities are still being prepared according to the old recipes (Handmade pasta, desserts etc. ): we strongly recommend it! Famous actors like George Clooney often stay along the Como Lake. He bought 2 villas there; therefore take the chance to come across such famous celebrities in restaurants or other locations. Please note that the house is close to a railroad. A strict non smoking policy must be followed at all times. The swimming pool will be open from the first week of June to the last of September. Changeover every Saturday (exceptions may be allowed during low season only). We stayed for one week in early June 2018. The property was superb, with everything you'd need, with fantastic views of the lake from the bedrooms and also the terrace. We travelled with an 18 month old and we were supplied with a cot and high chair, plus the villa and surrounding areas were child-friendly. Not only that, the family could not do more for us, including picking us up and returning us to the train station which was much needed in the heat and with a load of luggage! I would highly recommend this villa to fellow travellers, plus Lierna is a lovely town, with a number of shops for food plus the quite incredible Il Crotto restaurant which has to be tried! Lierna is a small and typical village on Lake Como. Just 700 metres from the property you will find La Riva Bianca (the White Shore), one of the largest stone beaches on the Lake and just a stone’s throw from the house there is a wide selection of bars, shops and restaurants. For your trips in the Lake area you can easily reach Varenna (5 km), the whole Lake area and Milan catching the train and avoiding traffic by public means of transport, ferry, passenger boat and hydrofoil you can also easily reach Bellagio and many other towns & villages on the Lake. The area is also very good for winter sports: St Moritz is just a leisurely one hours car ride away.